Your workspace analytics are defined by the filters you select. You can select a time period filter as well as a subject filter. The subject filter enables you to create filters with multiple subjects. By default, the “tracked subjects” filter is selected, which is composed of all the subjects that have time tracking enabled. You can create your own filter and select all the subjects you have access to. The time period filter allows you to select a timeframe and analyze how your team’s time was spent. It is similar to the subject time tracking analytics time period selection. These donut charts represent the total time spent by members as well as the total time spent per subject. 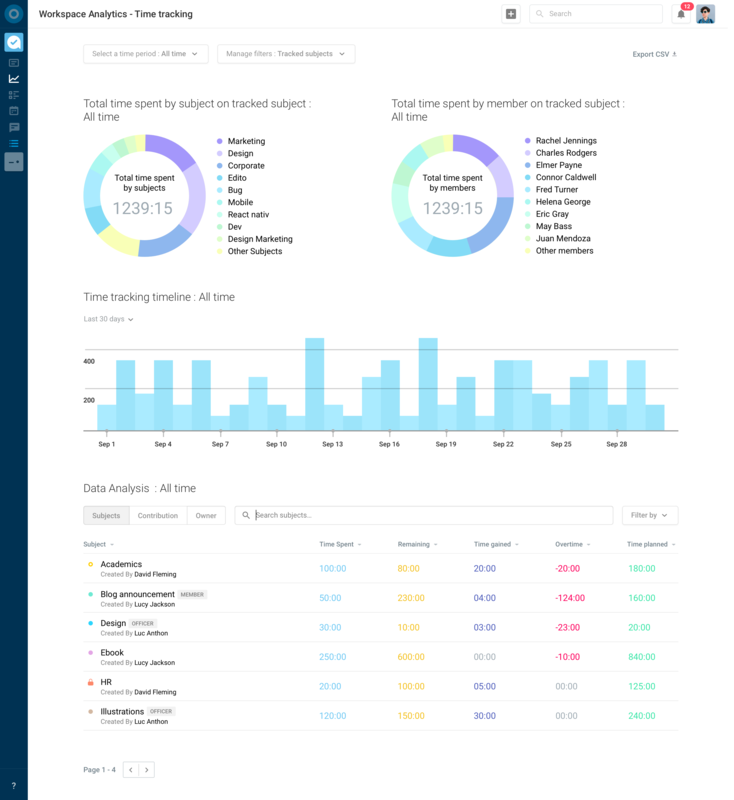 It allows you to see at a glance which subjects take up the most time, and who in your team spends the most time on them. Hovering over the chart with your cursor displays detailed statistics on both charts. The total time spent by subject can display the same time spent on multiple subjects. When this is the case, a warning is displayed below. This means that you have at least one task that is shared by more than one of the subjects you selected. The time spent on this task is counted multiple times: once for each of the subjects, hence the difference between the subjects and members total time spent stats. This graphic represents the total time spent by day on the subjects and period selected. Hovering over a specific day will display the numbers for that date. You can also change the number of days displayed when no time period is selected. 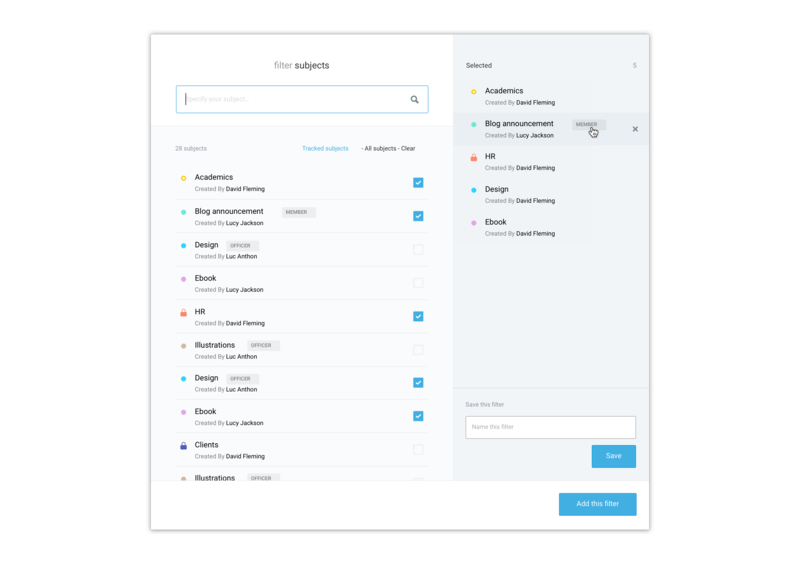 The detailed analytics panel regroups three different tabs: subjects, contributions, and assignee. The ‘subjects’ tab displays all the subjects selected with the filter, including all their statistics of time planned and spent as well as details such as remaining time and gained time or overtime. 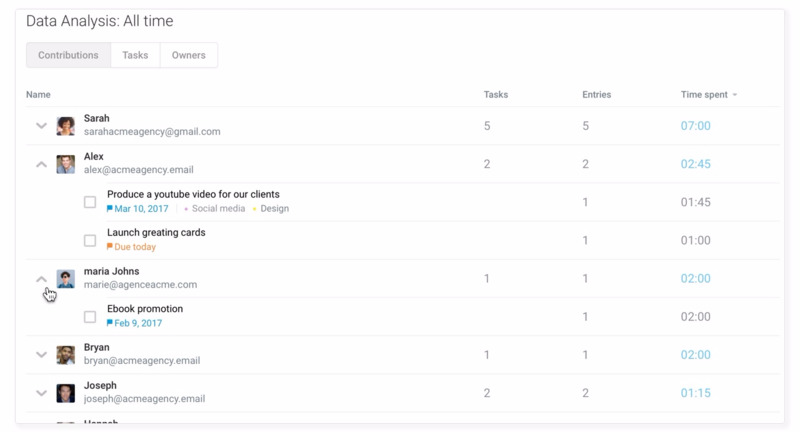 The contributions tab displays all the members that contributed to the subjects by adding time spent on tasks, even if they are not the assignee of these tasks. They are sorted by time spent by default, and clicking on their name will toggle the tasks they contributed to with additional details.